MISSION STATEMENT: The purpose of this Society is to join together individuals who share a common interest in collecting and breeding finches and softbills. 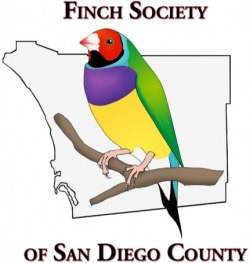 Welcome to the Official site of the Finch Society of San Diego County (FSSDC) Serving Southern California Finch and Softbill Breeders since 1973. The FSSDC is for all aviculturists with a love for and special interests in all varieties of Finches and Softbills, from little Zebra Finches to giant Toucans. Our members represent all aspects of aviculture: conservationists, collectors, breeders, show exhibitors, veterinarians, and pet owners. Club meetings are held traditionally on the 4th Sunday of each month with topics representing the many subject’s members find of interest; rare species conservation, aviary construction, hand feeding babies, nutrition and feeding tips, locating wanted bird species, identifying sick and unhealthy birds and whatever is topical. Once you join FSSDC, special benefits of membership are found in our monthly newsletter (mailed or on-line). It lists special events and the monthly speaker or program. There is a raffle or auction of birds and bird related items at each monthly meeting. Members get bonus raffle tickets for these monthly drawings. For those members who show up before the program begins, there is a free “early bird” raffle. Note: only club members may buy and sell birds from one another one hour before the monthly meeting. While there is a generous “snack” at each meeting, there is a once a year "free lunch", for members, at the annual Birthday meeting in September. We invite anyone with a love of aviculture to visit our club and become a part of this enriching community. The Finch Society of San Diego County cannot exist without its members. As a small volunteer run organization, it is your interest, presence and patronage that makes the club the success it is. Membership is one of the primary ways in which the club raises funds put on the programming and events that make it so special. Though a local club, FSSDC sponsors a major annual education event, Afternoon of Aviculture (AOA), along with the National Finch and Softbill Society at annual National Bird Show. You may wish to take a turn on the board of directors. Please consider the benefits of becoming a Club member, and please join this one of a kind club. FSSDC member, Summer Light is the author of “ A Guide To Owning Fully Flighted Pet Birds”. Summer has raised a variety of birds from finches to large parrots for the past 19 years. She currently lives on 2.5 acres in Elfin Forest, where she has 100 foot flight with a flock of cockatoos and some African grey parrots. She will talk about the importance of flight, housing, safety, and the difference between a small bird and a large bird flying free in your home. In addition suggestions on how to create bird rooms, bird stations and aviaries inside your home.